Can you guess what Zombies and Oreos have in common? The answer might surprise you: the commonality between the two has to do with the recently popularized practice of “Real Time Marketing.” Real time marketing is an on-the-fly marketing approach that promotes products or brands by associating them with trendy events in hopes of exploiting the event’s popularity for profitable gain and is a unique by-product of the Social Media revolution. In this world of “push notifications” it has become increasingly important for companies and organizations to communicate with… their investors in relevant and effective ways as Twitter and Facebook continuously decrease the degrees of separation between our real-time and online lives; this is where zombies and Oreos come into play. After a whopping 15,937 retweets and 6,217 favorites, Oreo literally stole the show, with a tweet that has since become one of the most viral and talked about pieces to ever hit Twitter. This single tweet has to be one of the most prime examples of real time marketing: it was relevant, humorous, trendy, and most of all timely. But this is Oreo we’re talking about; they are no small-time cookie company. So what about something a little more grassroots? On November 18th, 2012 at 10pm ET, the season finale of the tremendously popular The Walking Dead TV series aired on cable and millions of viewers tuned-in to see how a small group of people were getting along with their survival efforts after a widespread zombie-apocalypse. At 10:16pm, during one of the show’s first commercial breaks, a small time Nova Scotia Power Company tweeted a reply to a recent campaign called #AskNSP, which encouraged their followers to “ask them anything.” Very early on in the campaign, one of their followers had humorously asked “how long would the power stay on in Nova Scotia if a zombie apocalypse occurred?” Nova Scotia Power sat on the question for a few weeks and then picked this opportune moment to answer the man’s question by tweeting the link to a 1000-word, featured article on their website that explained, in very intense detail, exactly how long and why the power would stay on in Nova Scotia in the event of a zombie apocalypse – the article included infographics, photographs, and even survival precautions specific to the region. The power company incorporated the already intensely promoted hashtag #TheWalkingDead and ultimately the tweet garnered an impressive 66 retweets, 16 favorites, and a ton of social media interaction between NSP and its customers. Newscasters and bloggers everywhere began to pick up on this quirky social media success story as readers from New York, NY to Sydney, Australia tuned-in to the conversation; the buzz was undeniably positive. First, they were well prepared and ready to be interactive, progressive, and relevant with their social media outreach; ensuring that their content was well thought out, visually appealing, and genuinely interesting/entertaining. 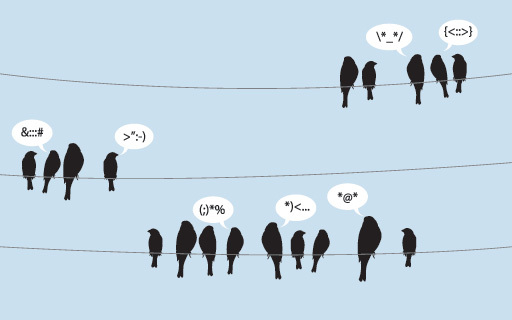 Second, they waited for the opportune moment to share that content with their audience. By waiting to hitch their trailer onto an already fasting moving, well hyped, and well attended event they didn’t have to worry about generating their own audience. Today, things like linked Twitter accounts and hashtags make it easy for anyone to jump into an already well brewed conversation, it just becomes a matter of knowing what event you want to associate with and then planning for it. 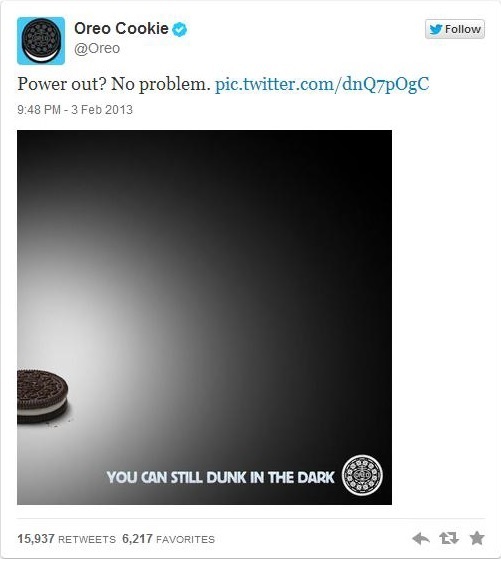 Using the example of Oreo, their marketing team already knew that they wanted to send out a tweet during the Super Bowl, they were just waiting for the right moment and when the lights went off, they knew it was time! Using the example of NSP, they had their initial great idea and a platform for execution much earlier on, but they had the smarts to use an already established event to promote their best content rather than try and generate their own hype. Now that we understand the correlation between Oreos and Zombies, how do we learn from their social media successes and apply it to our own fundraising efforts? The truest answer would be by simply putting ourselves out there; first, by preparing our content and creating campaigns that will enable us to interact with our donors and prospects, and then, second, by planning to hitch our best content to an already fast moving wagon; whether that be an event, a topical trend, a relevant campaign, or anything else that can self-manage an interactive and invested audience. The tools are already at our fingertips, and, what’s more, they are free! Social Media is already a part of our culture and there’s no question about whether or not we should get involved. The question, now, is how we best use these tools and the answer is: with relevant content, intelligent association, and timely execution. existing, less flexible, generally disconnected (and scheduled) media. physician) in a faded red zippered-hoodie sweatshirt bearing the school’s name. departments quickly grabbed the opportunity. And why not, for like Twitter this then offered the best free prime-time exposure (to a reliable and loyal audience – some being potential future students and then potential life-time prospects) and also periodic syndication. The sweatshirt-clad actress continued to appear and became a potent symbol by portraying an ambitious, (often too) empathic young soul aspiring to enter a sometimes heart-breaking medical specialty. Her character’s best qualities (perseverance, brilliance, social sensitivity) became associated with the medical school’s reputation for training physicians that deliver quality care, innovative research and compassionate clinical support. Perhaps more than other types of organizations, universities (with their capacity to generate substantial pr-worthy news) have benefited from this relatively new and powerful confluence of positive publicity, through all media, old and new, working at conscious and unconscious levels. Of course, this is one reason why we are seeing more universities confidently launching multi-billion dollar campaigns and completing them in record time. Strategically-connected media now drives viral fundraising campaigns to unprecedented streams of tipping points.